Rescue workers scrabbled through piles of rubble on Wednesday in a harrowing search for dozens of children feared buried under a Mexico City school, among hundreds of buildings destroyed by the country’s most lethal earthquake in a generation. The magnitude 7.1 quake on Tuesday killed at least 248 people, nearly half of them in the capital, 32 years to the day after a devastating 1985 quake. Mexico is also still reeling from a powerful tremor that killed nearly 100 people in the south of the country less than two weeks ago. Among the twisted concrete and steel ruin of the Enrique Rebsamen school, soldiers and firefighters found the bodies of at least 22 children and two adults, while another 30 children and 12 adults were missing, President Enrique Pena Nieto said. The public school is for children aged 3 to 14. Hundreds of neighbors and emergency workers spent the night pulling rubble from the ruins of the school with their bare hands under the glare of floodlights. Three survivors were found at around midnight as volunteer rescue teams known as “moles” crawled deep under the rubble. On Wednesday morning, the workers said a teacher and two students had sent text messages from within the rubble. Parents clung to hope that their children were alive. “They keep pulling kids out, but we know nothing of my daughter,” said 32-year-old Adriana D’Fargo, her eyes red, who had been waiting for hours for news of her seven-year-old. Overnight, volunteers with bullhorns shouted the names of rescued kids so that tense family members could be reunited with them. The earthquake toppled dozens of buildings, tore gas mains and sparked fires across the city and other towns in central Mexico. Falling rubble and billboards crushed cars. Even wealthier parts of the capital, including the Condesa and Roma neighborhoods, were badly damaged as older buildings buckled. Because bedrock is uneven in a city built on a drained lake bed, some districts weather quakes better than others. Parts of colonial-era churches crumbled in the adjacent state of Puebla, where the U.S. Geological Survey (USGS) put the quake’s epicenter some 100 miles (158 km) southwest of the capital. Around the same time that the earth shook, Mexico’s Popocatepetl volcano, visible from the capital on a clear day, had a small eruption. On its slopes, a church in Atzitzihuacan collapsed during Mass, killing 15 people, Puebla Governor Jose Antonio Gali said. In Rome, Pope Francis said he was praying for Mexico, a majority Catholic country. “In this moment of pain, I want to express my closeness and prayers to all the beloved Mexican people,” he said. Residents of Mexico City, home to some 20 million people, slept in the streets while authorities and volunteers distributed food and water at tented collection centers. Other volunteers, soldiers and firefighters formed human chains and dug with hammers and picks to find dust-covered survivors and bodies in the remains of apartment buildings, schools and a factory. With each layer of rubble that was removed, workers pled onlookers and volunteers for silence, desperate to hear the sound of any survivors below. Some volunteers in Mexico City expressed frustration at the disorganization among military and civilian emergency services, which competed over who would lead the rescue efforts. “There is so much bureaucracy and so many obstacles in the way of getting these kids out alive,” said Alfredo Perez, 52, a freelance civil engineer, who arrived at the Enrique Rebsamen school in the early hours of the morning to help. The middle-class neighborhood of Del Valle was hit hard, with several buildings toppling over on one street. Reserve rescue workers arrived late at night and were still pulling survivors out early Wednesday. With power out in much of the city overnight, the work was carried out with flashlights and generators. 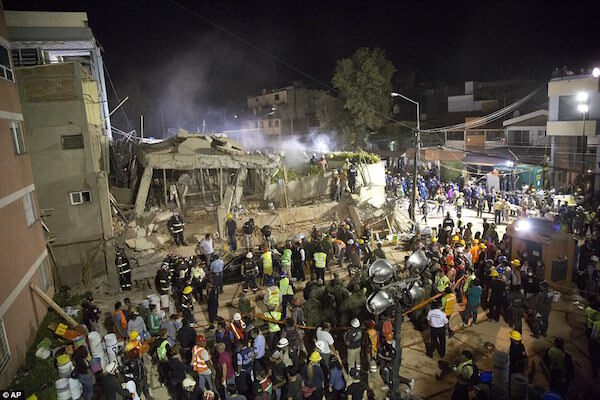 Moises Amador Mejia, a 44-year-old employee of the civil protection agency, worked late into the night looking for people trapped in a collapsed building in the bohemian Condesa neighborhood. In Obrera, central Mexico City, people applauded when rescuers managed to retrieve four people alive, with cheers of “Si se puede.” — “Yes we can.” — ringing out. Volunteers arrived throughout the night, following calls from the civil protection agency, the Red Cross and firefighters. The quake killed 94 people in the capital by Wednesday morning, according to Mayor Miguel Angel Mancera. In Morelos State, just to the south, 71 people died, with hundreds of homes destroyed. In Puebla at least 43 died. Another 17 people were reported killed in the states of Mexico, Guerrero and Oaxaca. The governor of Morelos state declared 5 days of mourning. Nearly 5 million homes, businesses and other facilities lost electricity, according to national power company Comision Federal de Electricidad, including 40 percent of homes in Mexico City. Power was later re-established to 90 percent of the areas affected. Still, much business and industry in affected areas remained closed. Carmaker Volkswagen AG temporarily shut its sprawling Puebla factory, its biggest outside of Germany, due to structural damages from the quake.